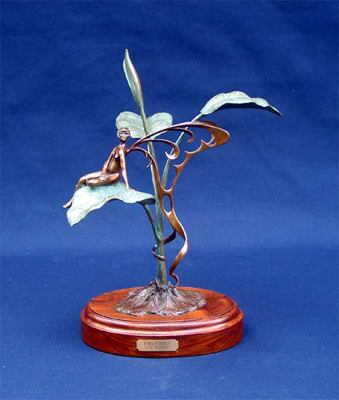 Bronze Edition of 24 16" h. x 10"x 12"
Fairies seem to have a universal appeal, probably because they represent an uninhibited freedom, and have a reputation for playfully mischievous pranks. This little sprite just happened by one day while I was watering my garden, and agreed to sit for me while I sketched her. Then she vanished.